The entrance to the Tower of David Museum, a splendid 16th century monumental gate. I enter the barracks. The smell of raw earth makes a first impression. My eyes take a moment longer to dial down from bright sun to deep shadow. A long hall of concrete, steel, stone, and dirt emerges. Excavations beneath the barracks have been conducted over the course of the last decade, but only in the last five months has this archaeological site been open to the public. It is my first visit to Jerusalem’s Kishle and I am excited. I met our guide only an hour before, but in that short time I am impressed. Eyyal is a soft spoken Israeli. He sports a fleece bearing the symbol of the Tower of David Museum. Under his arm is a large folder of photographs, drawings, and maps. The cover is worn. This is not his first rodeo. And he did. We started on the top of the remains of a stone tower. There, we took in a panoramic view of area and considered its strategic location. The position was absolutely commanding, higher than any other perch in the Old City. To the west, Teddy Park, just below the Jaffa Gate, was visible. View from the tower to the Old City. We contemplated the tower, neighboring structures, and memories of the palace of Herod the Great (famous in the Gospels as the Christmas “baby-killer’). The residue of his Jerusalem palace likely rests beneath our feet. From there we went down into the Crusader moat and explored features associated with its construction. The presentation was fascinating, but by this point, interest among the party began to wane. The children fussed; the photographer vanished. Despite Eyyal’s solid narrative, the appetite for antiquity can be an acquired taste. We passed under the shadow of the iconic minaret at the corner of the Tower of David complex. We then ascended a circular stairway of rusted metal to a fenced roof. From this vantage point we peered into a compound presently used by the police. Eyyal pointed out how Jerusalem’s governing authorities have been posted on this same space (remembered elsewhere as “Barracks Square”) for a very long time. View through the razor wire on the Kishle roof to the police compound. 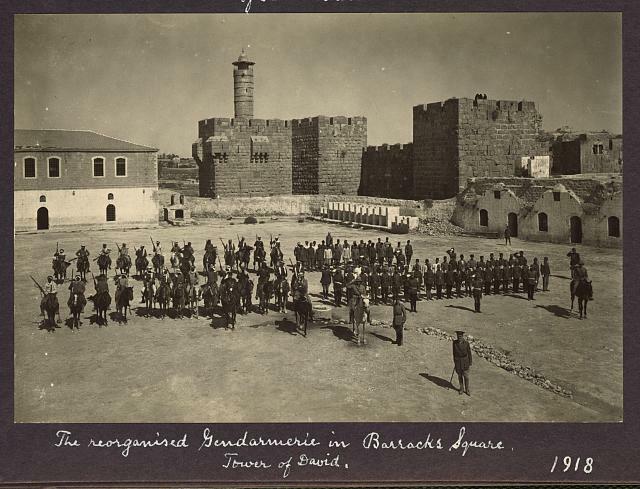 This photograph shows “Barracks Square” in 1918. Compare the facades of the perimeter buildings on right to the view of the modern police compound above. Image from here. Eyyal shows us photographs from the period of the British Mandate. General Allenby was here and in the stormy years that followed, the building was used to hold Jewish and Arab terrorists alike. When excavations began, the iron bars were still in place. Soldiers in Barracks Square on 19 March 1918. This image clearly shows the Kishle as a two story building with a tiled roof. Note its position just south of the “Tower of David.” Image from here. At this point our tour is reduced to four persons. We stand just inside the door and wait for our eyes to adjust to the darkness. Remains from the biblical period come into view. Prince Arthur, a son of Queen Victoria, presents medals and honors. Note the Kishle on the left. 19 March 1918. Image from here.